Room 1 is an ADA Deluxe Queen with views of the wonderful San Lorenzo River running from the Santa Cruz Mountains into the Pacific Ocean, you will enjoy a truly amazing scene of natural beauty during your stay at the Rio Vista. Room 2 is a Deluxe Queen with a complete shower booth with open concept to the room. Our Deluxe Queen is a spacious unit with seating by the window. 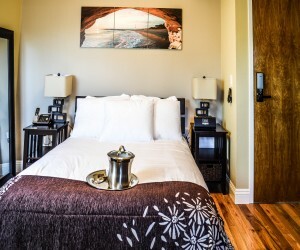 This room is located on the first floor & accommodates two persons. Room 4 is our Deluxe Queen which has views of the wonderful San Lorenzo River running from the Santa Cruz Mountains into the Pacific Ocean. 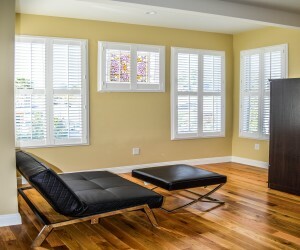 This room is located on the second floor and accommodates two persons. The bathroom consists of a jetted tub and a separate shower. Room 5 is a Deluxe Queen which has a complete shower booth with an open concept to the room. Our deluxe queen is a spacious unit with seating by the window. 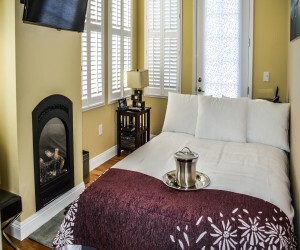 This room is located on the second floor and accommodates two persons. 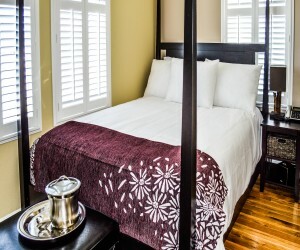 Room 6 has a queen bed in a smaller compact room with an open concept and a little balcony. This room has a shower and it is located on the second floor and accommodates 2 persons. 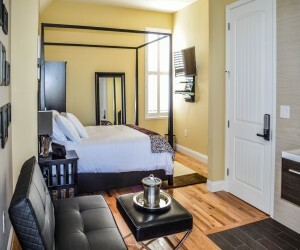 Room 8 is a compact queen in a small room with an amazing view of San Lorenzo River. This room is located on the second floor and accommodates 2 persons. Room 9 is an Attic queen and is located on the third floor. Originally this floor was the attic of the mansion which is now converted into unique rooms with high and low slanted ceilings and skylights. This room has the original arched windows still in place. 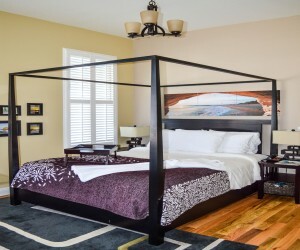 The attic queen has a custom shower and accommodates two persons. Room 10 is an Attic queen that is located on the third floor. Originally this floor was the attic of the mansion which is now converted into unique rooms with high and low slanted ceilings and skylights. 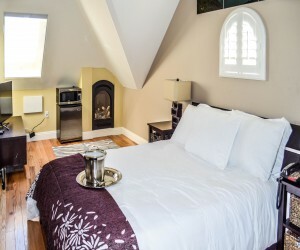 The Attic queen has the original arched windows still in place; in addition, this room has a shower with a open concept to the room and accommodates two persons. Deluxe Queen Room 14 is a Deluxe Queen with a shower over jetted tub with a open concept to the room. This queen room accommodates 2 persons. Standard Queen Room 15 has a shower over a jetted tub. Room 16 Queen has a shower over a jetted tub. Room 17 Queen has a shower over a jetted tub.